June | 2015 | Welcome to the RW Carbon Blog! 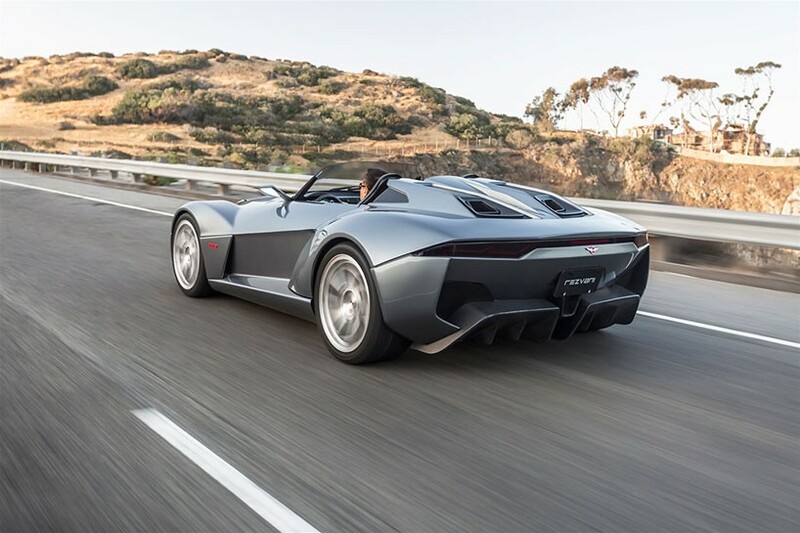 Southern California is world renown for our vacation getaways, but now we have a new presence, producing outrageous supercars for speed freaks around the world. 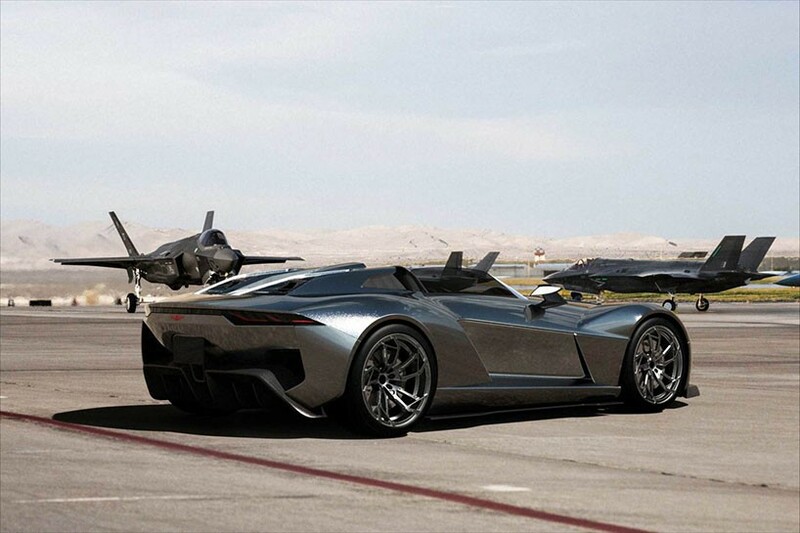 First we had Tesla with the new Model S and now Rezvani is making the news. 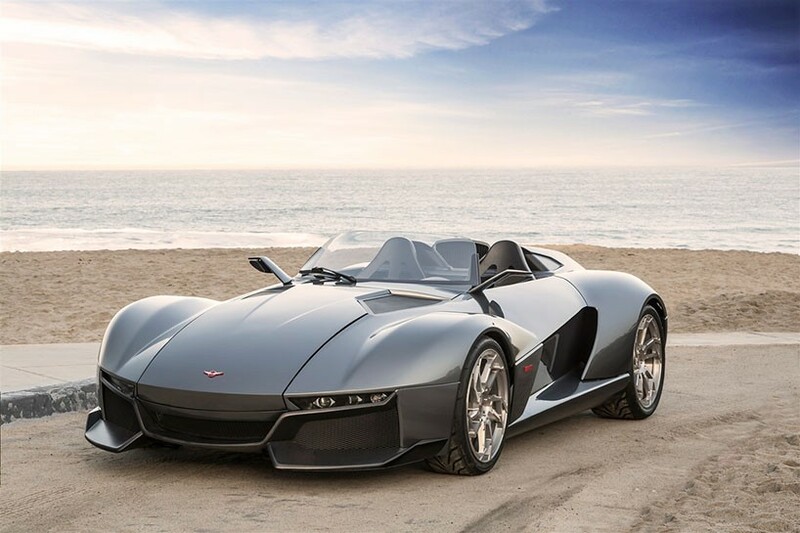 They are a fairly new automotive manufacturing company, but they have hit the industry by storm with their new creation the “Beast”. 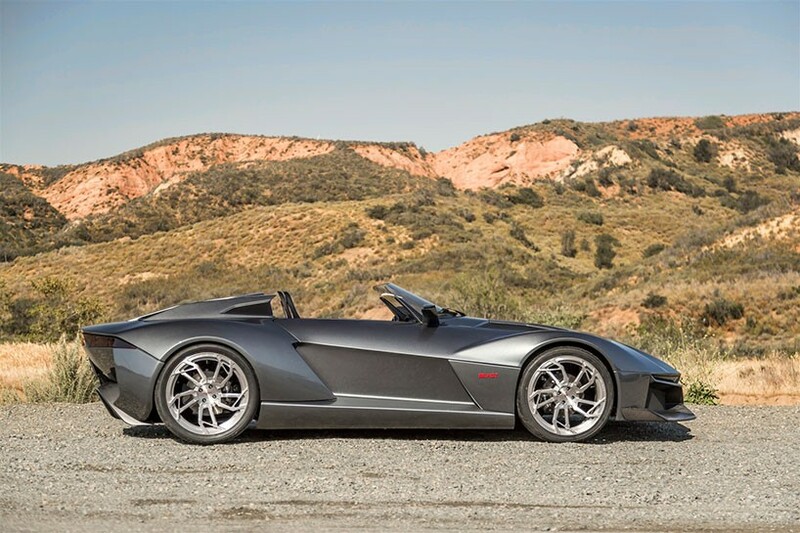 This 500hp beast convertible is constructed mostly from carbon fiber for an ultra lightweight design. 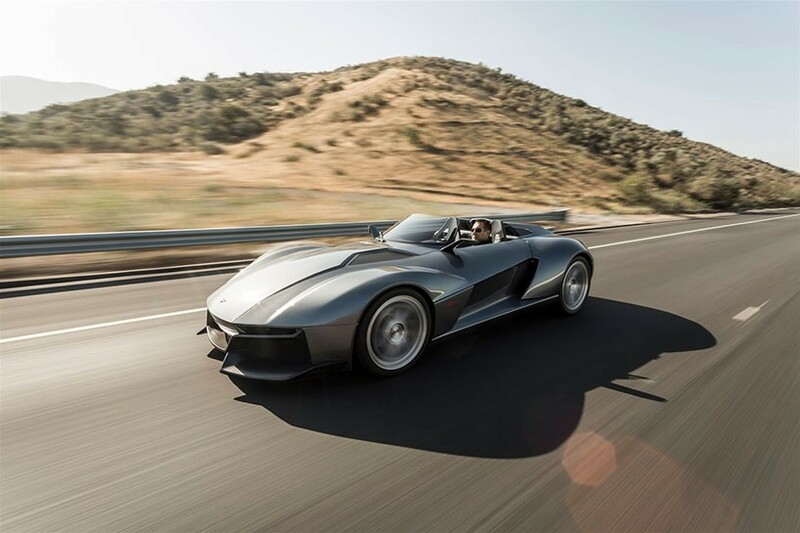 Rezvani engineers were able to keep the car as light as possible using advanced materials such as carbon, and a carbon steel chassis from the Ariel Atom 3. 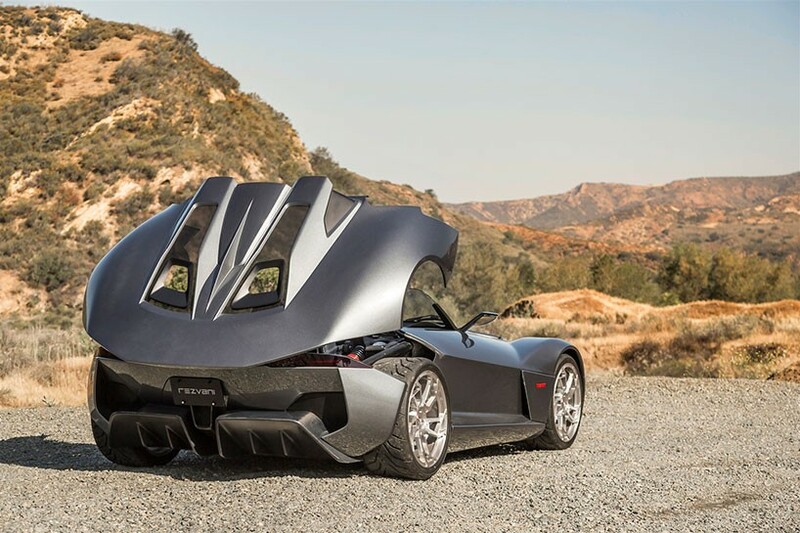 Weighing in at a mere 1,650 lbs (748 kg), the supercharged and torbocharged 2.4L 4 cylinder can rocket the “Beast” from 0-60 in just 2.7 seconds. This high output powerplant transfers its power to the rear wheels and is paired with an old fashion manually transmission that is almost free from any electronic help. 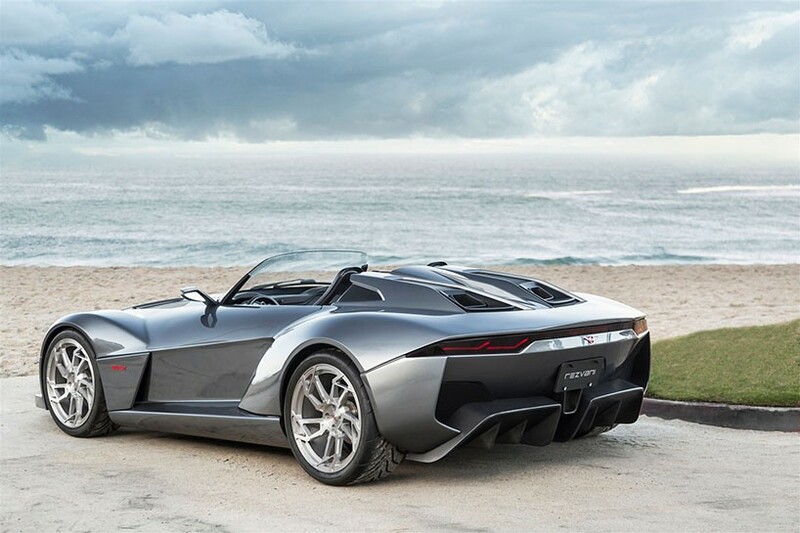 Continuing with its obsession with weight reduction, the interior of the Rezvani “Beast” includes carbon fiber seats with a matching steering wheel and apple’s carplay entertainment system. 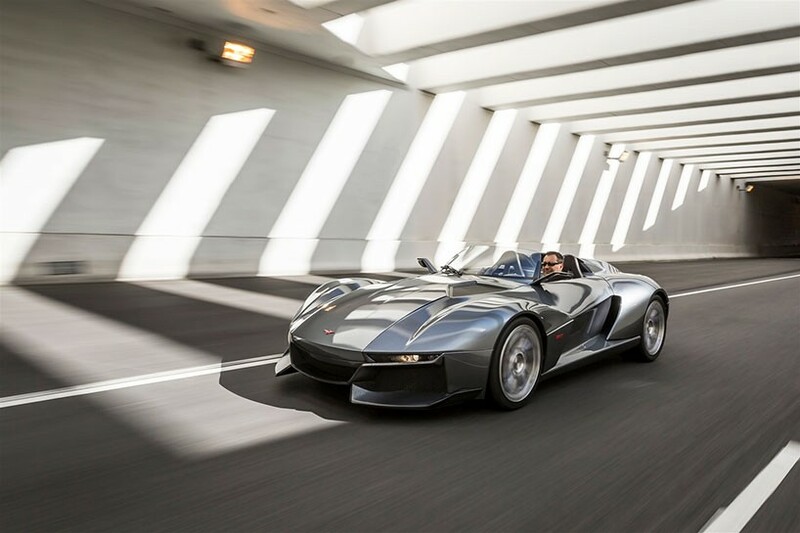 Automotive designer Samir sadikhov was able to create an aggressive supercar with low friction carbon fiber body panels that allow for maximum downforce at high speeds. 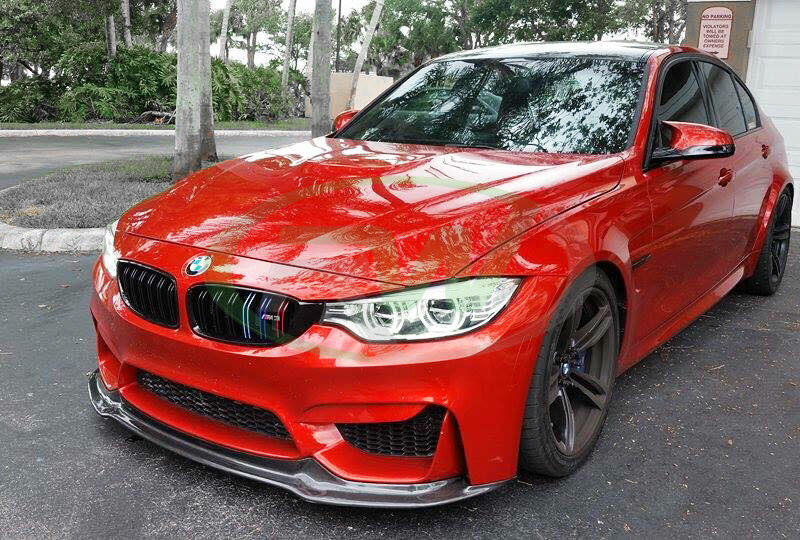 Furthermore, they used sophisticated 3D printing techniques to create the shapes of the headlight casings, taillight casings, and mirrors. 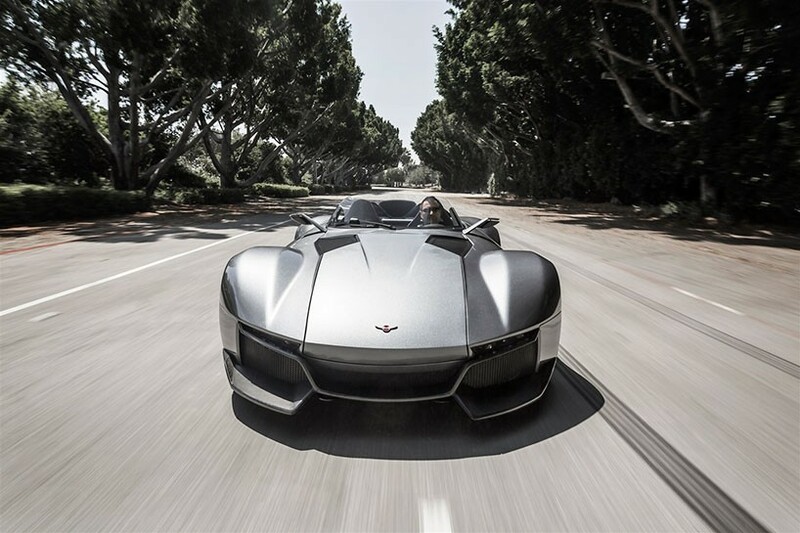 find the Rezvani ‘Beast’ on the streets in June of 2015. 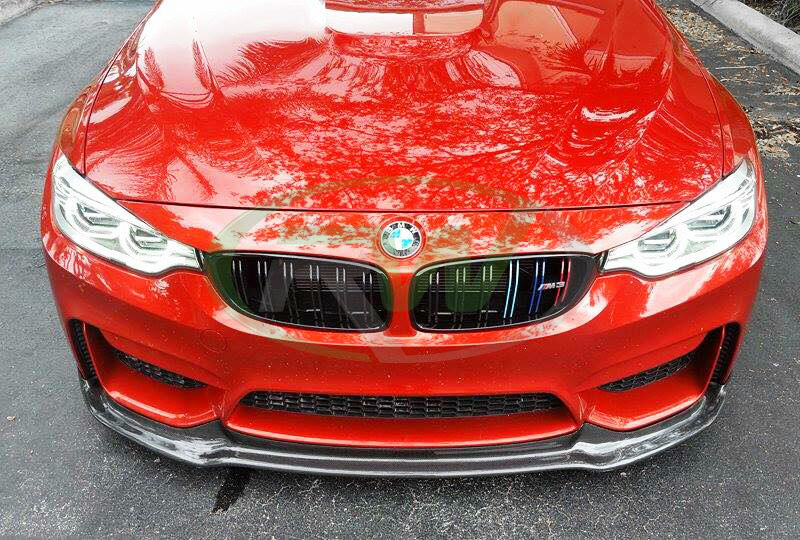 We just received some photos back from a 135i customer. 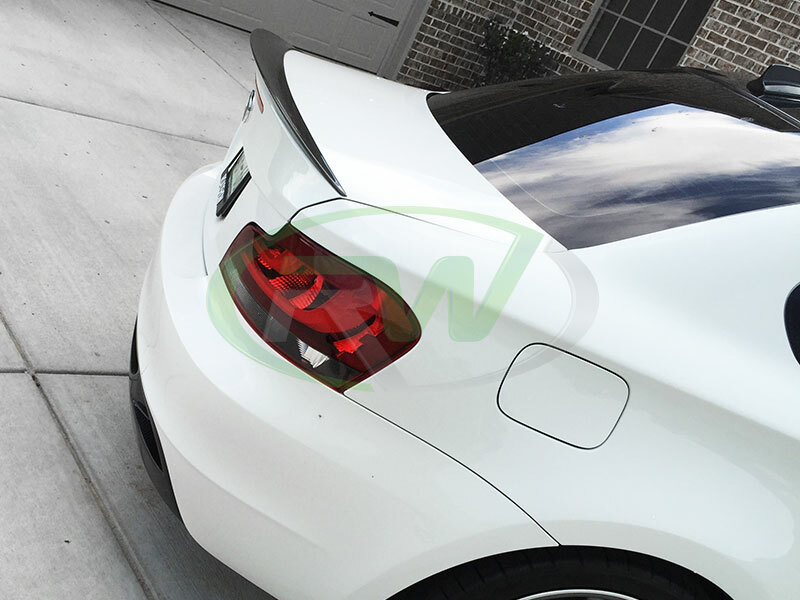 He decided to go with an RW Carbon Fiber Front Lip Spoiler, Performance Style Trunk Spoiler and Diffuser. White and carbon fiber is one of my favorite color combinations. 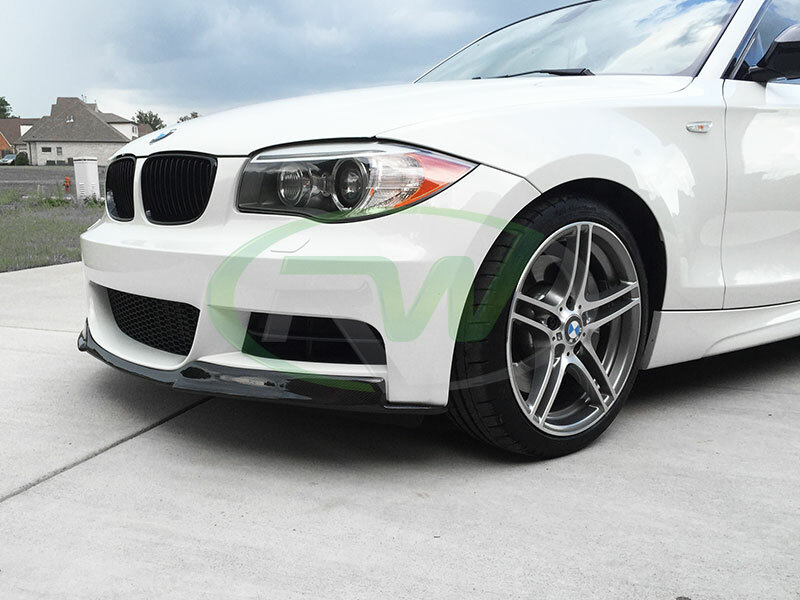 The contrast works perfectly with this BMW E82 135i. Below are links to the product pages if you want to see more pictures and read more about these 1 series products. 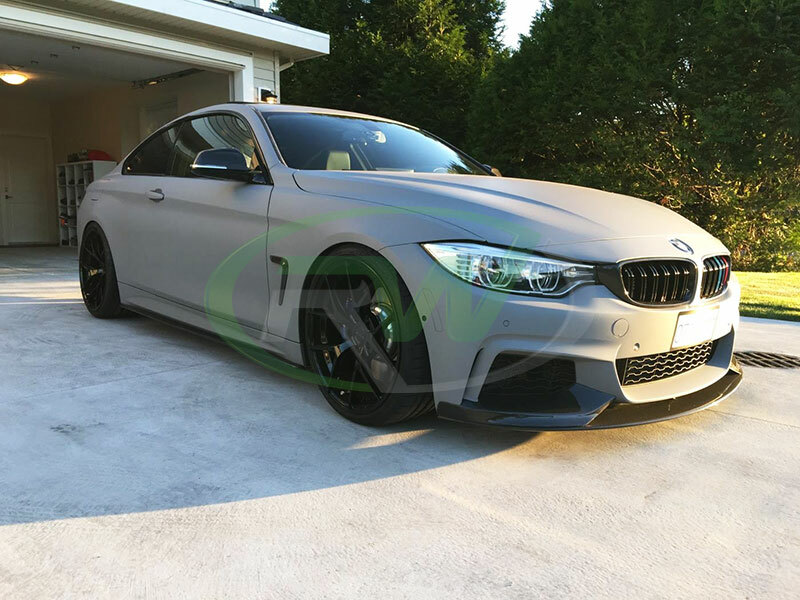 A good customer of ours from Canada decided to go with a full Battleship Grey wrap on his BMW F32 435i and finished it off with plenty of M Performance Style Carbon Fiber goodies. 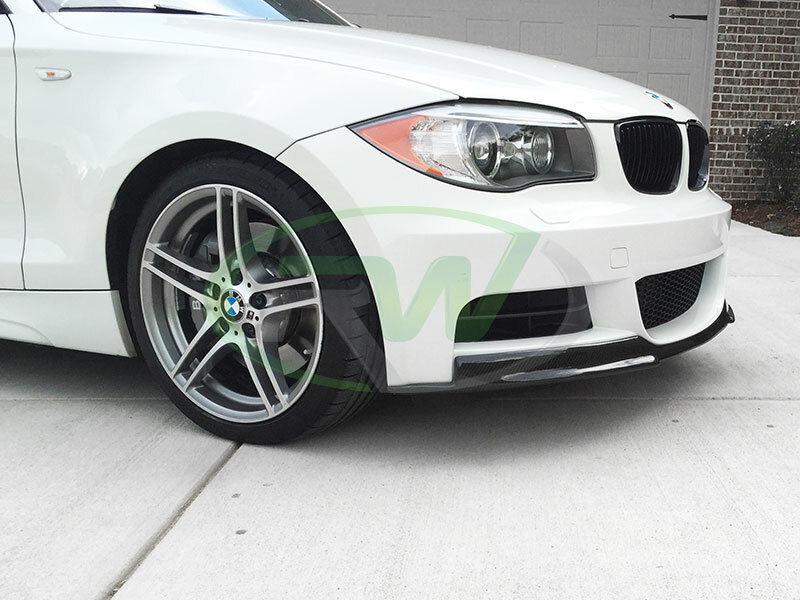 From us he purchased the Carbon Fiber Performance Style Carbon Fiber Diffuser, CF Fender Trims, CF Kidney Grilles and our new Carbon Fiber Side Skirt Extensions. 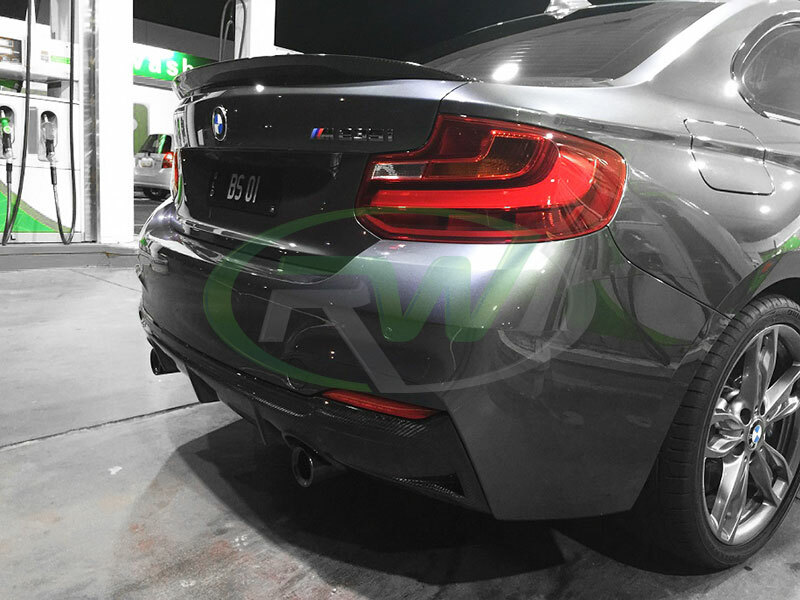 Other parts purchased on this build was the CF Performance Style Trunk Spoiler and Performance Style CF Front Lip Spoiler, which can also be purchased through RW Carbon. List of parts and links to the product listings are below. Click on the links to view pricing and more pictures. 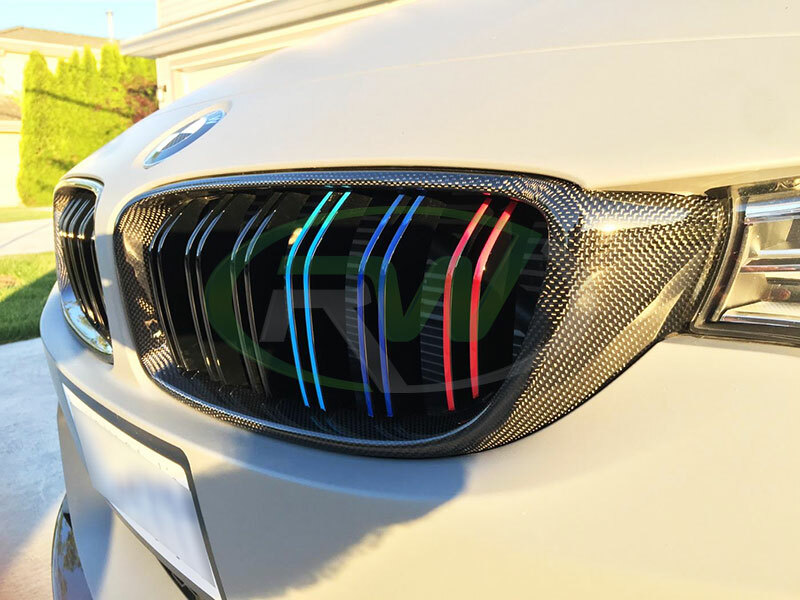 The release of our last BMW F22 product, the 3D Style Carbon Fiber Lip Spoiler, was such a success with the 2 series crowd. So we got to work on the diffuser so we have everything a F22 owner needs to get the full RW treatment (trunk spoiler, front lip, diffuser and mirror caps). 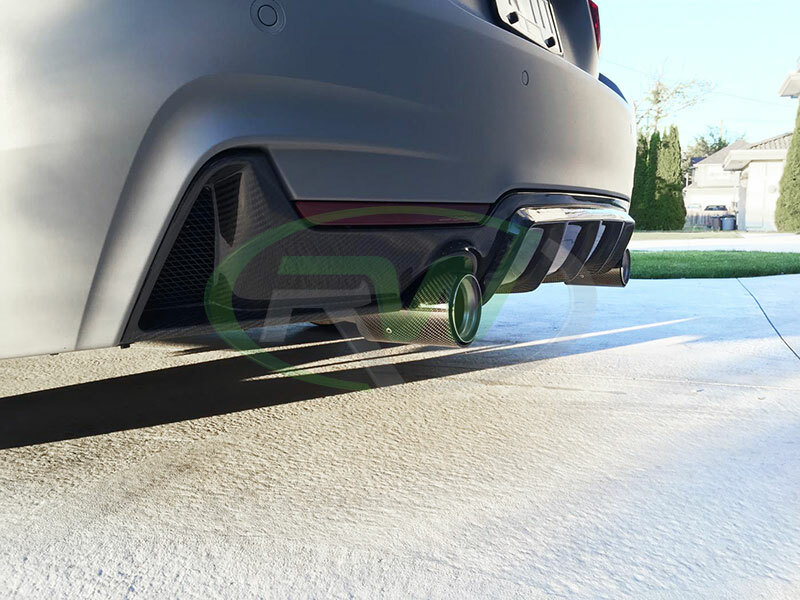 For the diffuser we decided to go with the Exotics Tuning Style, due to its great fitment, appealing design and huge popularity with the F22 crowd. 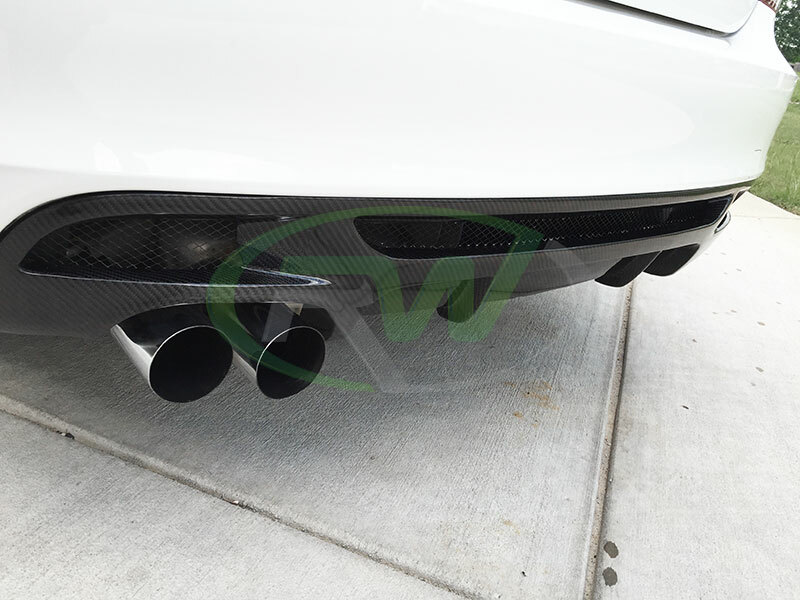 This diffuser, like all of our parts are made using real 2×2 twilll weave carbon fiber and is backed by our fitment and quality guarantee. All of parts pass through our facility in Pomona CA to be quality controlled and carefully packaged for shipping. 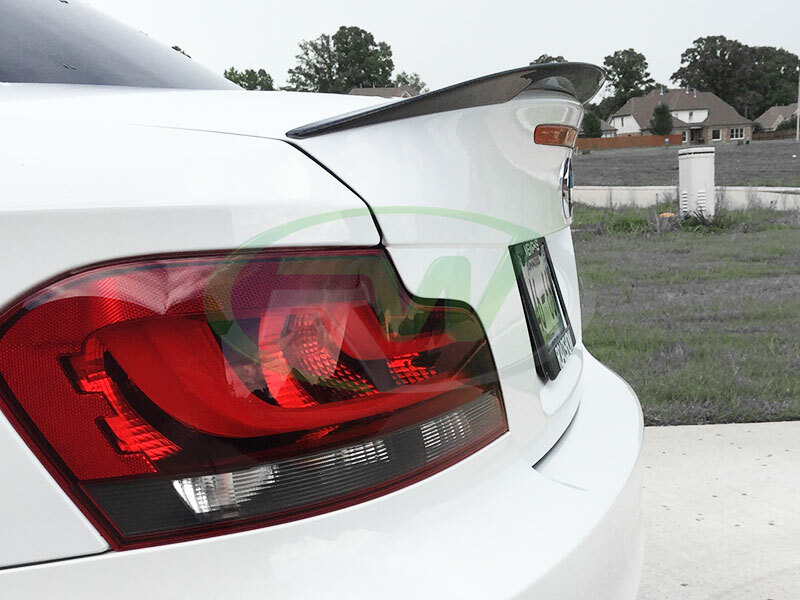 If you want to view more pictures or learn more about our new BMW F22 Diffuser please click the link below. 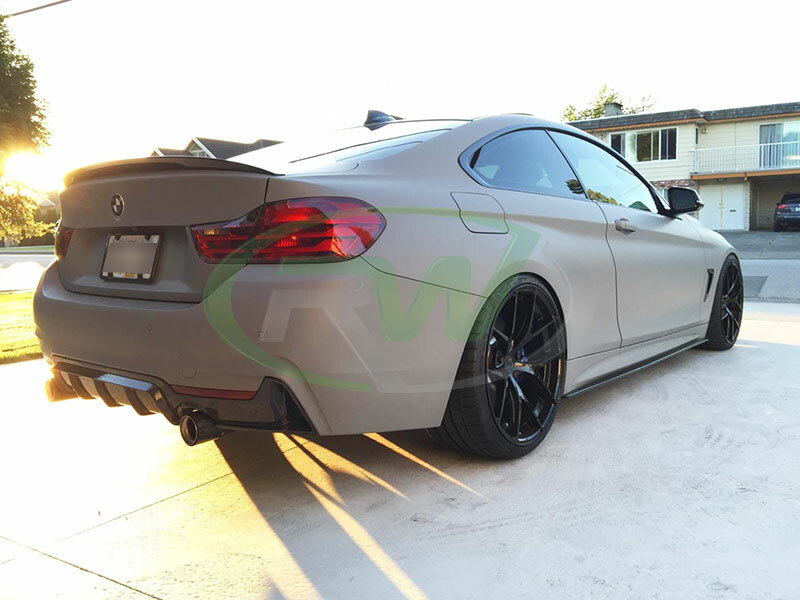 If you have any questions or concerns about our new Exotics Tuning Style CF Diffuser or an of our BMW F22 CF Aero Parts please contact a specilist at 714.328.4406. 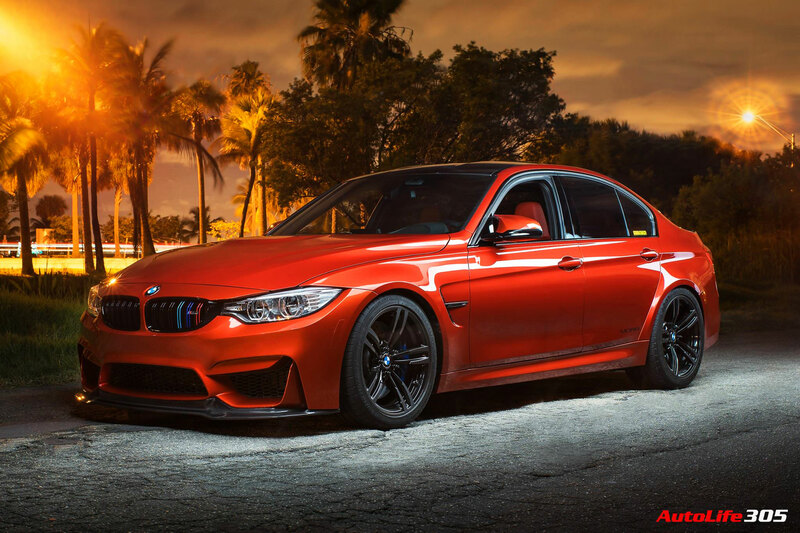 The new BMW F80 sedan, F82 coupe and F83 convertible M3 and M4 models have been all the rage of the BMW scene since they came out about a year ago. In order to keep up with the demand of these new cars and all the new carbon fiber aero parts that have been released, we are coming out with several new items that you may want to keep on the lookout for. 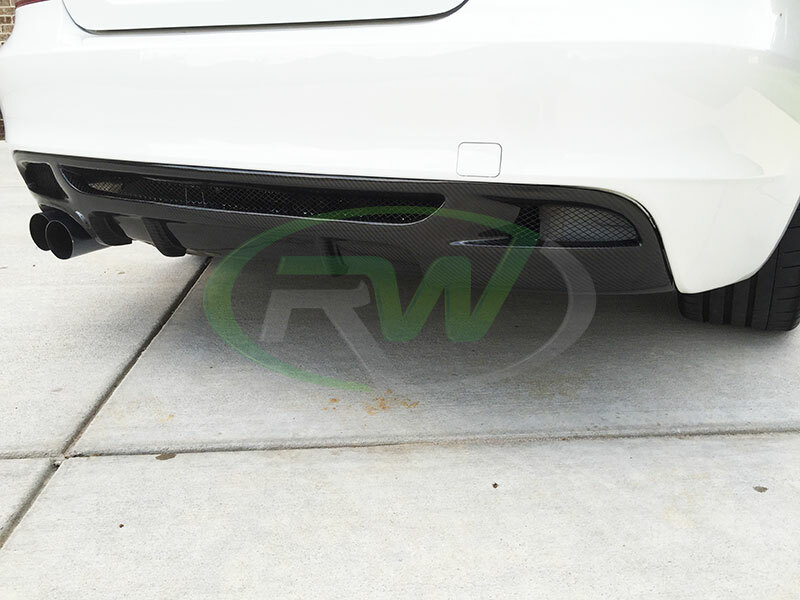 The first 2 are the RKP style carbon fiber diffuser and the 3D Style carbon fiber front lip spoiler. Both of these items will be available for purchase in about 3 weeks. For anyone who wants to be guaranteed one we do offer pre-orders on these items. 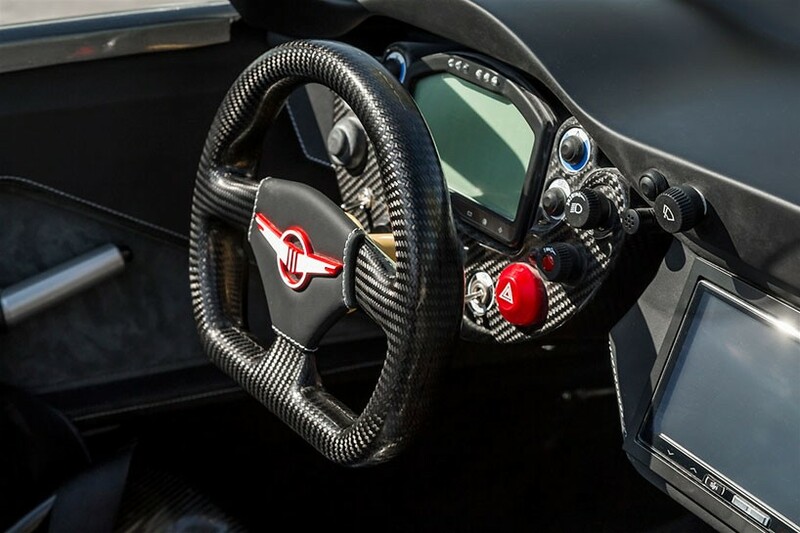 Feel free to contact a carbon fiber specialist today for any questions you might have about availability or pricing. Our sales number is 714.328.4406. 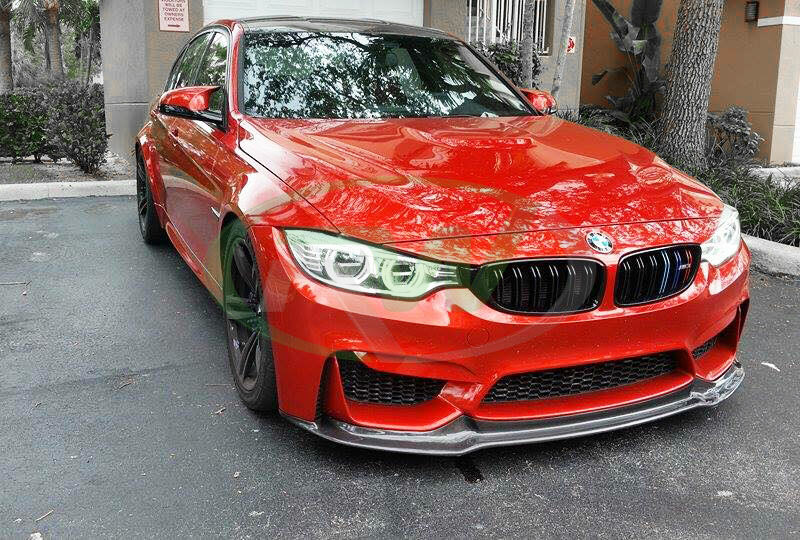 About a month after that we have the DTM Carbon Fiber front lip spoiler coming out (first installed pictures below). We are not taking pre-orders yet, but when the ETA comes closer this new item will be opened for pre-orderes.